Riding hats marked solely with BS/EN1384 are not legal for competition use from 1 January 2017, nor will they be allowed at British Horse Society (BHS) approved centres. If your riding hat is marked with both BS/EN1384 and PAS015, it should still be legal. However, it is your responsibility to check the rules wherever you are riding or competing to see if you are affected. Showing: Horse and Hound reported on 19th January 2017 that the only standards permitted for showing are now PAS 015; VG1; ASTM F1163 04a onwards; SNELL E2001 and AS/NZS 3838 2003 onwards. British Eventing: Top hats and beaglers are no longer allowed to be worn at British Eventing events and this includes any time that a rider is mounted at a BE event. The rule applies to national events only, so currently the FEI rules continue to allow riders to wear top hats for the dressage phase at CCI and CIC competitions. 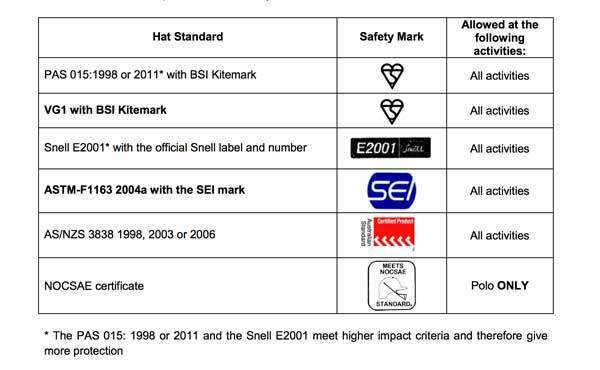 Protective headwear for BE events must be either PAS 015 or VG1 01.0402014-12 and must have either a BSI kitemark or an Inspec IC Mark as well as a BE hat tag. See www.britisheventing.com for full details. Riding Club: For 2017, all members will once again be required to have their hats tagged with an ORANGE hat tag before competing in any BRC Qualifiers or Championships. To download the latest hat and body protector rules and guidelines click here.